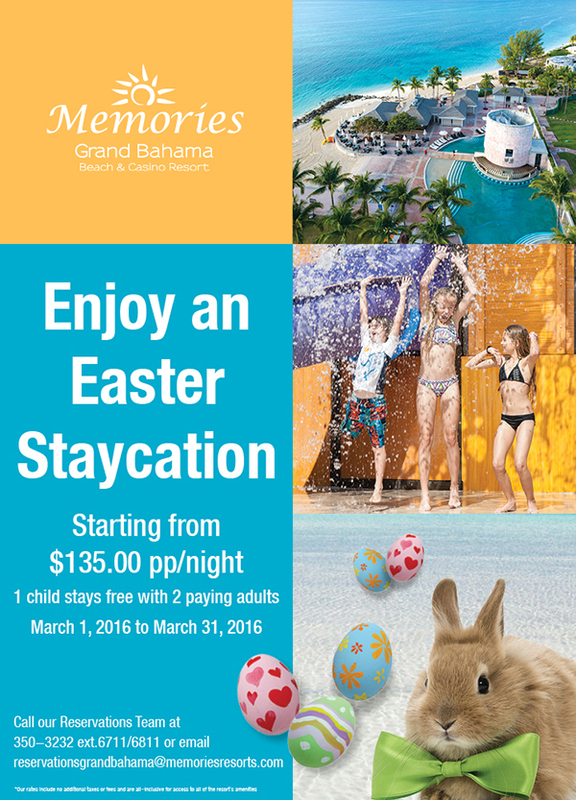 Freeport, Grand Bahama Island - Memories Grand Bahama Beach & Casino Resort invites you enjoy an all inclusive Easter Staycation starting at $135 per person per night. One child stays free with two paying adults Masrch 1st to 31st 2016. The all inclusive Memories Grand Bahama Beach and Casino Resort is the perfect vacation escape for couples, families and groups seeking some genuine time away together. It is also a golfer’s dream – breezy, warm weather and consistently sunny skies, combined with unlimited free green fees at its Par 72 Championship Reef Club Golf Course designed by Robert Trent Jones, make this resort a golfer’s paradise. Enjoy sumptuous gourmet dining at many of the upscale restaurants, featuring buffet-style and a la carte options, with thoughtful details such as a unique children’s buffet area and European-style café. Refreshments are always nearby at several themed bars stocked with international and local liquors. Treat yourself to a variety of first-class amenities, extended room service, and non-stop activities. Retreat to luxurious air-conditioned rooms and suites, grab a tasty cocktail at the bar, learn new skills with a cooking class, or try your luck at the on-site casino. Whatever you choose to do, Memories Grand Bahama Beach and Casino Resort promises you a vacation that is truly unforgettable.